The leisure or novice competition horse can have activity levels which alter from simply schooling and hacking to competing locally over the summer. These activities require more than a low energy mix but not necessarily a competition feed. It is important to monitor your horse’s behaviour, performance and condition to ensure that as his activity levels change he is still getting the required levels of energy from his diet. It is essential to ensure that your horse does not become overweight or lose condition and a medium energy feed is a great way of providing your horse with everything he needs without the calories or energy levels of a competition feed. Whether your horse is on box rest or is simply enjoying light or occasional work, his nutritional requirements are as important as ever. It is always crucial to ensure that your horse is receiving a well balanced diet, which provides all the nutrients he needs, even if he only requires a low energy feed. Low energy feeds are also used to help good doers maintain a healthy weight, without depriving them of their essential vitamins and minerals. For the excitable horse, lower energy feeds can also provide a well balanced diet without adding too much fizz. Our low energy mixes are specially formulated with low starch levels to help keep your happy hacker, good doer or recovering horse healthy and well. Fast Fibre is also barley and molasses free and is ideal for the good doer or for horses who tend to be hyper even on low energy feeds. Fast Fibre is also particularly useful for horses with dental problems as it can be used as a partial or complete hay replacer if necessary. Also suitable for horses and ponies prone to laminitis. Fast Fibre has a unique recipe which enables it to soak in under a minute, so you can be sure that your horse’s feed is always fresh. During trials Power & Performance has consistently improved focus, stamina and ultimately competition results. Tested to the very highest levels, by top riders and amateurs alike, across a variety of disciplines, Power & Performance has already helped many horses discover their true potential. When your horse is working hard it is essential that you are providing him with the correct types of energy and nutrients to maximise his performance. From driving to dressage or endurance to eventing, each horses requirements are different. Our range of feeds for hard work and competition provide energy in two ways. Slow release energy from sources such as fibre and oil, for stamina and steady energy levels, and fast release energy from a selection of cereals to really give your horse a boost when required. All of our feeds for Medium and Hard Work contain elevated levels of vitamins and minerals and electrolytes to replace those used when you are competing or riding at a high level. The palatable low energy mix with extra herbs. Protexin helps maintain a healthy digestive system by assisting the balance of beneficial gut flora. Based on the original Quiet Mix, with all the additional benefits of added alfalfa and carefully selected premium grade herbs, including mint, garlic, rosemary, sage, thyme, nettle and cloves. Herbal Quiet Mix is also suitable for horses that are resting, working lightly or ridden occasionally. As horses get older they tend to reach a stage when they start to look their age and lose weight more easily. There is no set age when their nutritional needs change, however it’s important to ensure they are always receiving the correct diet to suit their needs. A veteran or conditioning feed can help to provide them with the extra essentials to keep them looking and feeling young at heart. Weight loss and struggling to keep good condition can affect horses of all ages. Regularly monitoring your horse’s condition with a weigh tape will allow you to pick up changes more quickly than you would be able to see by eye, and allow you to adjust the diet accordingly. In general, you should be able to run your hand lightly across your horse’s ribcage and just feel his ribs, but not see them. Veteran Vitality has been specially formulated for horses and ponies from the first signs of ageing. Part of the Barley & Molasses Free Range Veteran Vitality is high in fibre but low in starch making it ‘kinder’ on the digestive system. Live Protexin is included to help maintain a healthy digestive system. Veteran Vitality is highly palatable to even fussy feeders and has a good calorie level to help weight maintenance, as well as being fully balanced with vitamins and minerals. A high energy performance feed. Contains oats and other fast releasing energy sources for instant energy. Contains Protexin to help maintain digestive health particularly at times of stress such as travelling and competitions. For horses in medium or hard work, such as showjumping, eventing, dressage and hunting. Light Competition Mix is an increased energy muesli mix with boosted vitamin and mineral levels for performance. Used by Pippa and William Funnell. The aim of anyone feeding youngsters is to encourage steady growth and correct development. Any rapid increase in bodyweight through overfeeding will not produce a bigger, stronger horse. Instead it will put additional stress on immature limbs and joints. Foals should be monitored closely and feed adjusted if weight increase is too rapid. It is in the foal’s first year that the majority of it’s growth takes place. As a rough guide, foals are born at 10% of their adult weight and will reach 60% of their adult weight by the time they are 12 months old. They will also have attained 90% of their mature height and 95% of their bone growth by this stage. It is also crucial to consider the nutritional requirements of the pregnant or lactating mare and working stallions. Our Stud & Youngstock feeds will provide the correct energy levels and essential nutrients to both mares and stallions standing at stud. No added, sugars, molasses or cereals. High in fibre, low in starch – suitable for horses that are resting or in light/medium work. Suitable for horses or ponies that are prone to Laminitis (but not overweight) or Cushing’s Syndrome. Sugar & Cereal Intolerance Diet includes long fibre (unmolassed alfalfa and oat straw chaff), a small amount of micronised peas, linseed, several herbs and yeast to provide a rich natural source of vitamins. The inclusion of Protexin may help to maintain healthy digestive and immune systems. Being high in fibre and low in starch, this feed is also suitable for horses or ponies which are prone to Laminitis, when more energy or condition is required than can be provided by ‘L’ Mix. Low starch, low calorie, high fibre. ‘L’ Mix may be fed to horses and ponies on box rest or light work. The inclusion of long fibre in the form of alfalfa and chaff (both low in fructans) ensures more chewing time, which is beneficial for horses or ponies on a restricted diet, helping to maintain a healthy digestive system. Quality vegetable proteins and unsaturated oils help provide essential nutrients while yeast provides a rich natural source of vitamins and minerals. A unique blend of premium grade herbs, specifically for healthy hooves, work in synergy with other ingredients. Food intolerances may produce many problems and they can affect the health of your horse in numerous ways. Most of what you feed your horses probably contains significant quantities of molasses and syrups – whether from the feed itself, or from chaff, or sugar beet. Molasses and barley, although common feed ingredients, can cause a feed intolerance. Pellet free and easy to chew – also extremely palatable. Protexin and prebiotics may help maintain the balance of beneficial bacteria in your horse’s gut. Old Faithful’s Special Blend provides easily digestible sources to maintain condition, as well as high quality protein. For use at whatever age your horse starts to “drop off” condition and not look as well as he used to – for some this may be 14 years of age, but for others it may be at 22 years! A blend of linseed and soya oil helps to maintain healthy joints and can assist skin and coat condition, and this mix is designed to be appetising for the fussy feeder. Herbs work in synergy with other ingredients to provide an extremely effective feed for maintaining weight and condition. For horses that struggle with hay or haylege, Fast Fibre can also be fed to boost older horses fibre intake. Calm & Condition is also used successfully for competition horses who are working hard but need to remain sensible. Boosted vitamin and mineral levels and premium grade herbs also combine to produce optimum condition. As Calm & Condition contains a small proportion of unmolassed sugarbeet we recommend that it is mixed with water before feeding as products containing sugarbeet will expand. Used by Pippa and William Funnell. Formulated to meet the higher nutritional demands of broodmares during pregnancy and lactation. Can also be used to feed working stallions and growing foals and youngstock. Stud & Youngstock Mix, which has elevated levels of micronutrients is usually fed in the last three months of gestation and during lactation. It is also suitable for working stallions, foals, yearlings and two-year olds, including natives and warmbloods. Protexin is included which may help maintain healthy digestive and immune function, particularly at times of stress such as when travelling, foaling or during weaning. Quick soak– soaks in 30-60seconds! 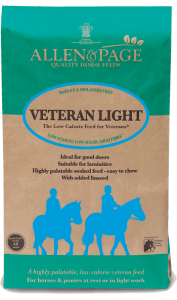 Veteran Light provides all the nutritional requirements for optimum health in older horses and ponies yet it has a low calorie/energy level, ideal for those who are good doers and holding weight well in their golden years. It is high in fibre and low in starch and sugar, making it suitable for horses and ponies prone to laminitis. Veteran Light also includes prebiotics and probiotics to help maintain a healthy digestive system and linseed is added as a source of Omega 3. Veteran Light contains a blend of premium grade herbs making it highly palatable even to fussy feeders! Quick soak – soaks in 3 minutes! Cool & Collected® has been specially formulated for horses and ponies at rest or in light to medium work. It is high in fibre and low in starch and sugar, making it ideal for horses and ponies that tend to become fizzy on traditional mid-range energy feeds. Being fibre and oil based, Cool & Collected® provides slow release, stamina giving energy. Cool & Collected® is particularly beneficial anywhere you need a calm and composed horse or pony. 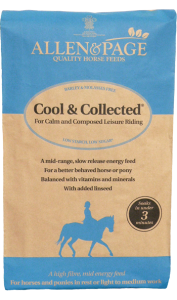 During our trials of Cool & Collected®, we had some fantastic results with regard to behaviour; horses fed Cool & Collected® showed much less reactivity (spookiness or fizzy behaviour), and fewer stereotypes such as windsucking, compared to when the same horses were fed a medium starch feed.